We can't begin to thank you enough for running such an amazing school where Emma and Carter always felt safe and cared for. 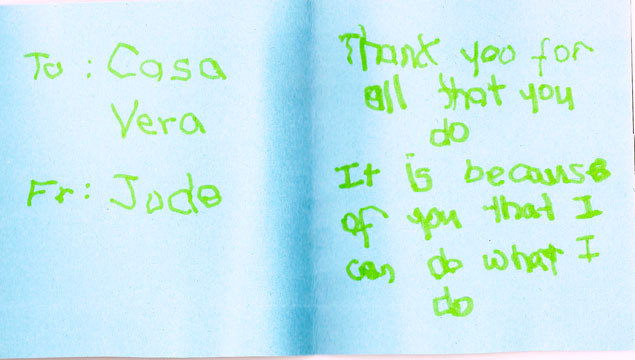 We truly appreciate your sincere kindness and patience toward the children at Casa Vera. Thank you for creating a great environment for Emilia to play and learn. Emilia is happy at your school and enjoys all the activities. We (Maria, Siena and I) would like to say thank you for helping us raise our daughter. You and your staff over the years created an awesome environment where we never worried one day when Siena was in your care. The staff and school environment laid an amazing foundation for her transition into Grade 1. Besides the Montessori way of teaching (which we value) you offered the little things that we believe made a significant difference in Siena's development and allowed us, as parents, a peace of mind. 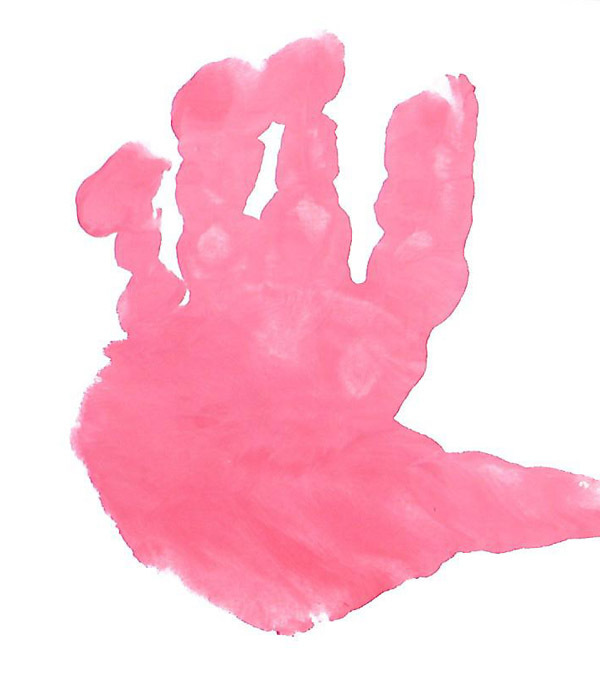 For Siena, she enjoyed the extra curricula activities such as dance and clay class. For us, you offered meal plans which meant, we didn't have to worry about lunch and exposed her to different foods. During the morning drop off, we were able to walk her to the classroom front door and after school pick was easy as well. Overt he years we enjoyed the Spring and Fall concerts, Mother and Father Day festivities and school trips. We found your team (staff) always pleasant and we always received a good morning or good bye in the afternoon. They would let us know if Siena was out of sorts for the day or had a wonderful day. Again, thank you for encouraging Siena to blossom into a young confident girl, which we believe was one of the best investments we have ever made. You left an amazing impression on her; her favourite pretend play activity is playing school which can last for hours and hours. She is the principal, mom is the teacher and dad plays the substitute teacher some times. Thank you for providing both Colin and Leah with a calm and nurturing learning environment. They always look forward to attending school and have so much love and respect for all the teaching staff. Thank you especially for taking care of Colin for four years. We sincerely wish you a peaceful and happy summer! The love you give Teo, and all the children, transcends Casa Vera. I cannot begin to say "Thank you" to all of you at Casa Vera who take amazing care of Luke. We are extremely proud of Luke's progress everyday. We are grateful for all the care and love given to him. He enjoys talking about his activities at the dinner table every night. He enjoys going to school!!! We wish you a great summer and see you in September. Thank you for your patience to help me learn and grow, to keep me safe and happy. Thank you for always encouraging me to try and to see the potential in me when I couldn't see it myself. You have always made yourself available even outside of school hours. Thank you for your dedication to us. Thank you so much for all of the care and support our children have received. Oscar will miss it here. 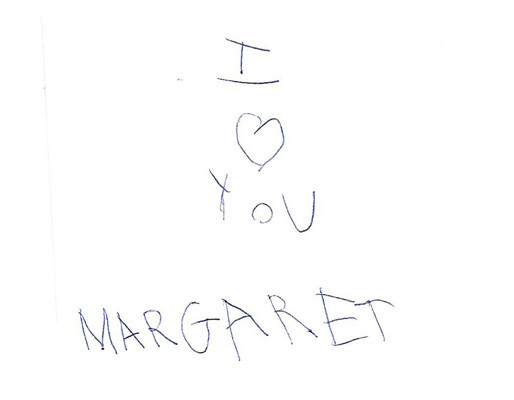 Thank you so much for all your patience and love shown to Margaret over the years. She really enjoyed coming to school every day. Thank you for such a beautiful experience for Carmela's first year of school. Your warm smile and kindness made all the difference. We made the best choice at Casa Vera. Thank you for the wonderful work you do. Thank you for your patience, creativity, love and support. We know he is in good hands with you and for that we are so very grateful! Thank you for looking after Everett and teaching him so much! Since starting at Casa Vera, Everett has been speaking so much and cleaning up after himself. He wants to do everything himself and is always happy to go tom school! Thank you for knowledge, you patience, your time, your vigilance! Thank you for caring for our son! Thank you for everything you do on a daily basis for Nia and all the kids! Know that your hard work is not unnoticed, and we appreciate it very much! Please call mama. Thank you, Ms. Viera, for teaching and for being mad at somebody who's not listening. Thank you so much for being so supportive with Seyon and caring for him like he was one of yours. I know it's not easy with all the little ones but you and your staff do it with full heart passion. I hope I can enrol Seyon as one of your students some time soon. Thank you for making Massimo a part of your Montessori family for the past 2 years. We appreciate all of the extra effort (concerts, extra curriculum classes, celebrations) you put is as a principal. All the best to you and your staff as you continue to touch the lives of our most precious little ones. I want to thank you for helping Massimo to grow academically, but more importantly, socially/emotionally. It may not show now but I think in the years to come, he will be able to handle social problems and (hopefully) will be more respectful to teachers because of the hard work you put in. From the bottom of my heart, I appreciate the love + care he received! Have a great summer + all the best! Thank you for the support, patience and care you have given to Valentina. She speaks very highly of her teachers and always tells us stories of her day and what she's learned. Valentina has also expressed how happy she is being there with all of you. She has progressed and has developed so much, which makes us very happy and comfortable knowing she's in great hands. Thank you for a great school year, see you in September. Thank you so much for supporting Teo's development and for your nurturance and warmth. We feel comfortable knowing that he is safe and cared for with you. 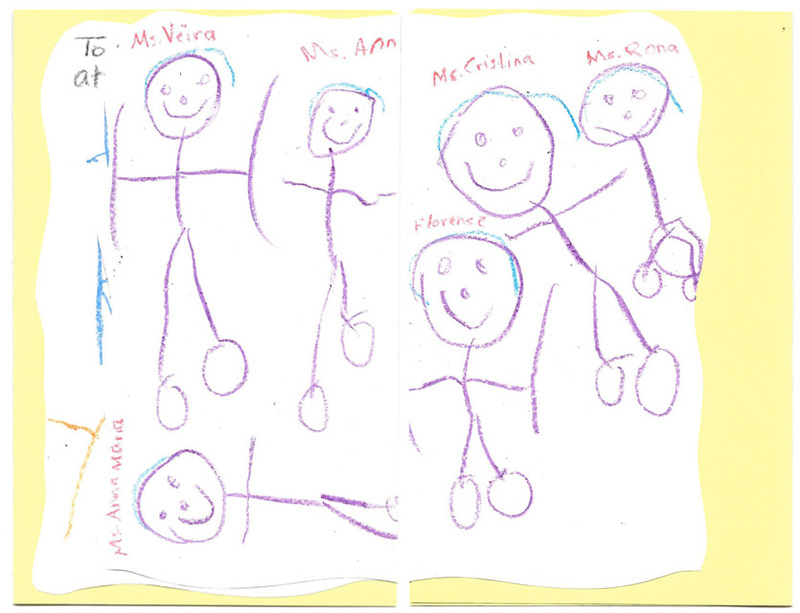 Thank you for your professionalism and care for Imani and all of the children at Casa Vera. Thank you for a great year and for making it a good experience for us all! Looking forward to building relationships and of course watching Joseph grow! Thank you for your kindness and hard work. We are grateful that Emilia attends your school. Thank you so much for taking such a good care of Margaret. She progressed a lot this year and she loves coming to school every day. I'm sending this email to say Thank you with all my heart to you and to all the teachers and assistants that during this last year showed my daughters a beautiful way of learning, how to develop social skills and how to become the wonderful human beings they are. Maria, Mafalda and I will never forget this Casa, Place that made us so happy and so heart full! Thank you for all you do on a daily basis. It's obvious that you put a lot of care into your work - from your efforts to communicate openly with parents, your hard work on holiday concerts, your flexibility in answering my calls when I have questions/concerns, your passionate involvement in the student's education. Not only as principal but also as a fellow educator! I could go on + on. We parents appreciate and feel blessed to have our children in such capable, caring hands! Just a little something to say thank you for running such a wonderful Montessori school. Emma has grown to love her teachers and has made new friends. We feel at ease dropping her off every morning. Knowing she is in good hands. We look forward to seeing you again in September. Have a wonderful summer Sincerely. Thank you for all of your encouragement and guidance this year. We truly appreciate all the work it has been to continue to nudge Colin forward. 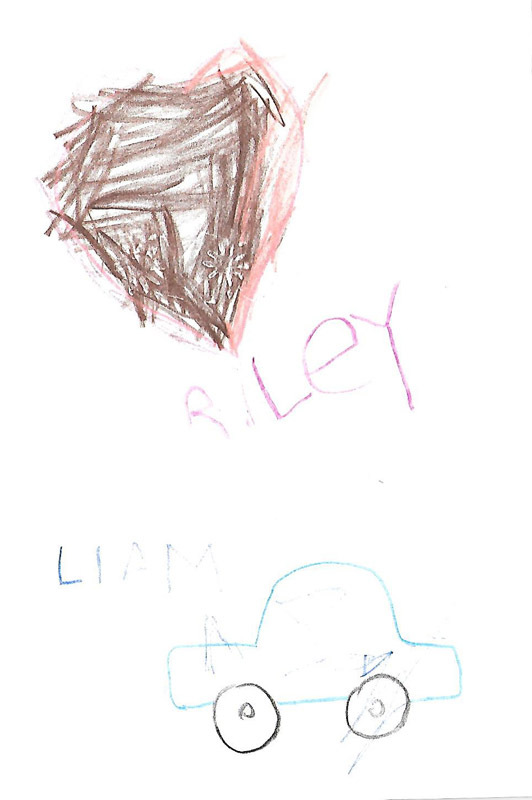 We thank you for all of the care you show Riley and Liam everyday. We are amazed by how much they learn in your care. We will miss seeing you and we wish you all the very best! Thank you so much for being so kind and caring toward Margaret. She really enjoys being part of Montessori's Family. 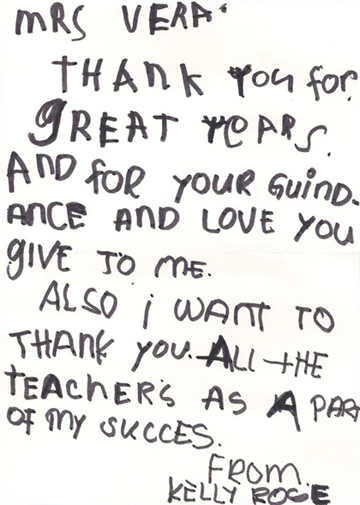 Thank you for all that you do daily to support Massimo's emotional, social and academic development. He loves going to school, enjoys playing with his new friends, and is so proud every day when he brings home a craft. We truly appreciate it. We hope you enjoy your Christmas vacation with family and friends. Thank you for being so helpful as Emma transitioned to daycare! You and your wonderful staff have been wonderful and we hope you have a restful holiday. Thank you so much for being so kind to Margaret and help her develop and improve her skills. Wishing you a Christmas and New Year full of joy. 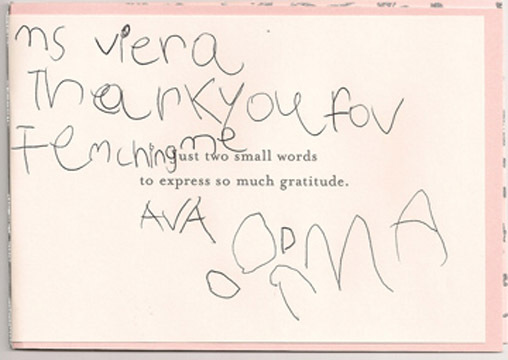 Thank you for everything you do for me and all the other children at Casa Vera Montessori. You are a wonderful Principal! Thank you for teaching and caring for Cilton + Caia all these years. We thank you for everything you have done. You will always be a part of our family!! We'd like to thank you for all you've done for Noa. 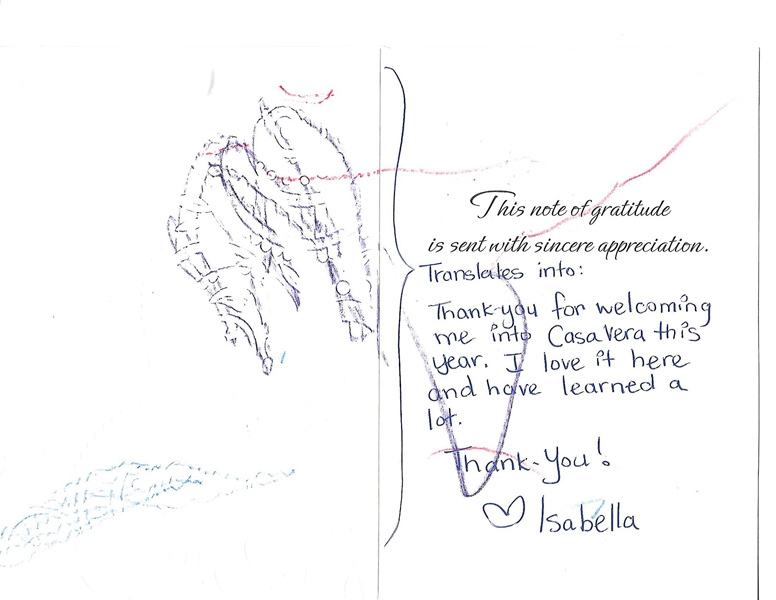 Your guidance and care have given her such a positive start to her school career, and for this we are grateful. We wish you and the school all the very best for the future! Thank you for teachers for guiding us, inspiring us and making us what we are today. You all have been fascinating teachers. You always taught us well, never giving up. But now that we have grown up, I realize you always gave us what we needed. One hundred years from now, it will not matter what my bank account was, the style of house I lived in, or the kind of car I drove. But the world may be different because we were important in the life of a child. Casa Vera Montessori, you will always have a special place in our hearts. Words cannot express our gratitude for all these years of providing Maya with a wonderful base to her new life. I would like to thank you for all your patience, time, energy, effort, love and caring that you given to both Catherine and Elizabeth. It is a very scary time when you have to leave your children in the care of another person, but it was easy with you and your teaching staff. Thank you for being a positive influence on Kate-Nicole's education over the past few years. In addition, we would like thank you for your support and patience during Nicola's birth. We recognize and thank you so much for your help and understanding. We plan to have Nicholas part of the program in September 2015. Thank you for welcoming me to your school with open arms. I am really enjoying my time at the school. Thank you for taking care of me and teaching me. Thank you for another good year at Casa Vera. Continue the great work educating and providing a nurturing environment for young ones. Thank you for a wonderful year at Casa Vera. Your passion for education and love for your school has made it a home for Maeve here in Toronto. Thank you so much for welcoming Noa (and us!) into Casa Vera family. She has really blossomed since she joined your school and we are thrilled with all that she is learning. And she is so happy there! Thank s for a great year with Ava and Maddy. They both have learned a great deal and shown a difference in growth from last year. Thank you so much, for being such a positive influence in Kaitlyn�s and Kira�s Lives. You are an amazing teacher and a great principal and we really appreciate you! Wishing you the very best of the season!!! Every day, Joshua amazes us and astounds us � our deepest thanks for your love, commitment and contributions to his development and education. We are so impressed with Casa Vera Montessori School. We would like to express our sincere appreciation to you, the teachers and all the staff at Casa Vera The past two years Jason has been part of a nurturing and stimulating environment that only gifted teachers like yourselves can provide. I can�t thank you enough for your dedication, devotion and caring attitude from all your staff. The Osmond family would like to thank you for Cilton. He has grown so much, and the big boy he is today is because of you and your staff and your school. He will miss you all very much. Thank you for a successful 2010/2011 school year. You have made us feel like a part of the Casa Vera family. Your warmth and dedication shows in your teachers, the environment and program that you offer. Enjoy your summer and we look forward to seeing you next school year. Thank you for all that you have done for our son Oliver. We look forward to new and exciting year. Jason enjoys and looks forward going to school every day and that is thanks to your devotion and dedication to all the children! Thank you so much to Ms. Viera and all the staff for making Casa Vera such a Special place. Best wishes during this Holiday Seasons. 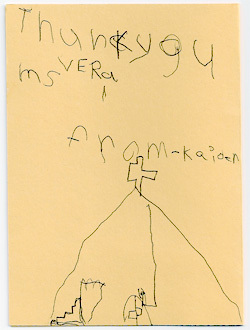 Thank you so very kindly for your tremendous efforts and patience with Kaiden. You have truly been a great source of inspiration for both Kaiden and myself. Casa Vera is truly a special place! Aliyah has grown so much in the 2 short years she's been there. Your kindness and devotion to the children and their learning is commendable. 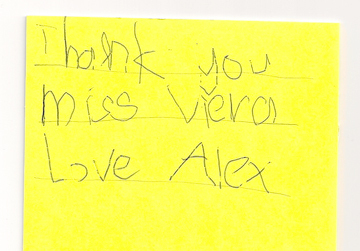 Thank you for the excellent care that you and your staff have provided for Alex. He has learned a lot at Casa Vera and I can only hope that his new school will be as caring and nurturing as you were. I really appreciate all that you have done for Alex. A big thank you to a wonderful teacher. We are thankful for your dedication, gentle spirit and loving patience. You have provided a safe environment for our daughter Emily to flourish and learn over the last 4 years. You have touched Emily's life and she will miss you and though we say goodbye with tears, we will leave with happy memories in our heart. 'Teachers change the world one child at a time'. Wishing you continuous success in a well chosen profession. She adores you and everyone at Casa Vera! 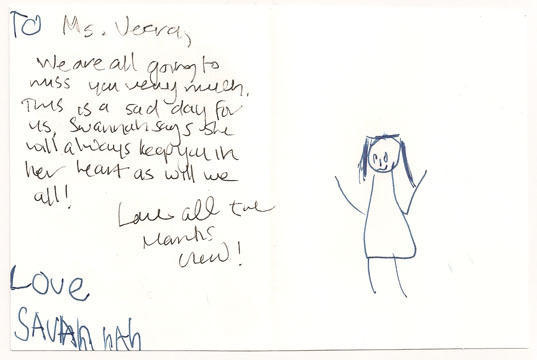 She looks forward to each day and that is a credit to you and your staff. I have to admit, I wasn't very familiar with the Montessori way of teaching. However, I learned a lot over the 4 years my child was enrolled at Casa Vera. 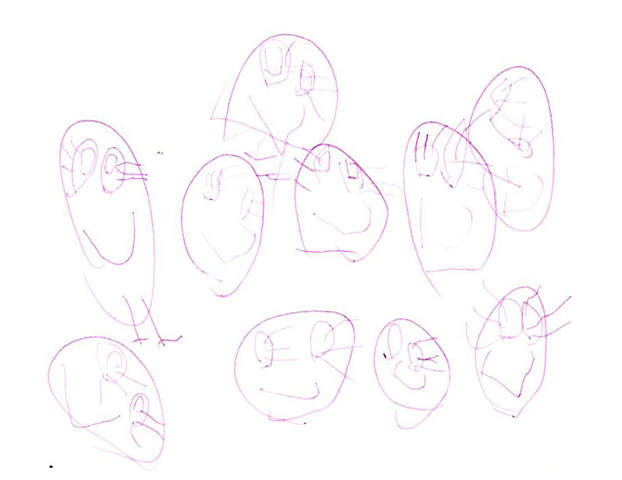 It is an approach that encourages children to explore things and can move at their own pace. My wife and I follow the same approach at home when we do activities with our daughter. Our daughter was very shy in the beginning and hardly spoke to other people. Casa Vera has brought her out of her 'shell' Our daughter is now very confident and has made many friends. She found many things that interests her and continues to want to explore further. Ms. Viera and her wonderful group of teachers have done a great job making a warm and positive learning environment. We hope many children will have the opportunity to attend the Casa Vera Montessori School and have a fun experience as we did. We can't thank them enough. Thank you SO MUCH for the fantastic care you've taken of my children over the past few years. Your school was nurturing and exceptional and it will be genuinely MISSED. Life has many stages and it sadden me to say goodbye to such dear 'friends'. Good Luck with your future. Wishing you continued success. 3 years ago, when Liam first began his educational journey with you, my husband and I were nervous as we watched him enter your classroom. Our only child never seemed smaller then that day, as he walked away from us to start school with you. Our fears were quickly put to rest that evening as he was eager for another day at school. He couldn't wait for tomorrow to arrive. Since then his attitude hasn't changed one iota and now 3 years later, he is keen and ready to enter grade one. Casa Vera Montessori School is and exceptional place created and run by a truly exceptional person. Ms. Viera, you are an inspiration to us all. I believe you are one of those people who would achieve great success with any endeavor you undertook, and so I believe we are very fortunate that you chose to become an educator. Actually with you it seems more a calling than a simple choice of profession. Your insightful way encouraging learning and development in every aspect of a child's realm is absolutely heart warming and something both child and parents benefit from. Your natural and boundless love for children, creativity, experience and sense of responsibility are a powerful combination. The result is a cheerful, welcoming and stimulating classroom and gathering of dedicated, nurturing and creative teachers. We can't thank you and your wonderful staff enough. My family and I wish you every happiness and if there is ever anything I can do to help you, perhaps even share some time over a cup of coffee or tea, please do not hesitate to call. It is with great sadness that my Stratos must leave such a warm, safe and happy environment as Casa Vera. But it is with much joy that he leaves as a wonderful, confident and communicative mature 6 year old. Because, of the time he has spent here and been allowed to grow. 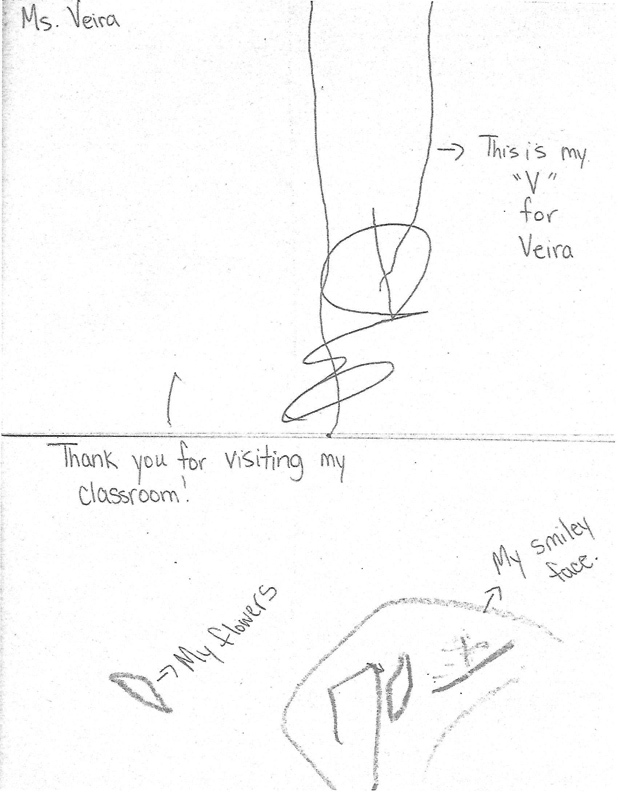 Casa Vera has been the best first school experience anyone could ever hope for. The children are loved, and guided firmly. The best is always encouraged from the children and the best is always expected of the teachers who teach them. I am confident because of his great beginnings here; he will thrive where ever he goes. Sincerely and with great love and respect. It is with a sad heart that the school year comes to an end. This year, June not only means the beginning of summer but the end of Grace's and Rene's Montessori journey. Having been trained as a Montessori teacher, I decided long before I had children, that they would follow the path of Maria Montessori's pedagogy. I could not have discovered a better casa dei bambini then Casa Vera Montessori. Your school embodies the true meaning of Montessori. Grace and Rene have discovered so much in the two years with you. The eagerness with which they explore the world around them is wonderful to see. I often hear, 'I have to tell Ms. Viera', whenever they find something new or experience something exiting. This means a lot to me. It means that you have touched their hearts. It means the memory of you will forever be embedded in their minds. I asked Grace and Rene to share some thoughts with me to pass to you and their words couldn't hold more truth. Grace said 'Mommy, school won't be the same without Ms. Viera. She is our family. It hurts my heart to go.' Rene's words were less eloquent but still powerful,'I'm going to Ms. Viera and my school.' This is how you impacted their lives and mine. You and your staff have done a phenomenal job in creating and environment where the children feel safe and where learning is natural occurrence. I wish you continued success with your school. Cassius has enjoyed a stimulating and nourishing environment over the past two years at Casa Vera. He has gained compassion and great sense of worth. I have grandson that only has grown with his Montessori education, but actually glows with love of life. Cassius plays and gets along with other children and adults, always putting their feelings first. I am very grateful to you for your love of children and the great understanding, sympathy and encouragement that you show each individual child. I will miss the children as well and the parents I have gotten to know over the years. Cassius will miss his friends and teachers. Life goes on and Cassius is ready to face a new adventure and he owes you and your great staff his gratitude. He will carry with him many great memories. We would like to thank you for your patience and dedication to our son. He has developed so much since attending your school. He talks about the teachers everyday which gives me a sense of security because I know he is being taken care of well. He has learned so much since September '06 and without hesitation enjoys waking up in the morning to learn something new. I recommend anyone to bring their child to Casa Vera Montessori School. Thank you so much for being a part of Claudio's life. It was one year ago that Emily started at Casa Vera. As parents we were extremely anxious as our only child would be away from us for the first time. We were unsure of how Emily would react and be cared for. We were quickly reassured, your kindness, patience and love for children was quite apparent. Emily has spent a very happy year, learning and developing her uniqueness. As a new school year begins we wanted to acknowledge your kindness and express our gratitude. We look forward to another exciting and fun filled year. Thank you for being a wonderful teacher. You have definitely made a difference in Stratos'life and learning. Thank you for providing such a warm and stimulating environment. Your love of children and teaching is wonderful and shows everyday. Rob and I highly recommend Casa Vera Montessori School to all families who are seeking an outstanding educational experience in a nurturing and loving environment. It is apparent that Mrs. Viera Scurova is caring and very dedicated in helping my child. Selena grows in knowledge while developing socially and emotionally. Selena talks about Mrs. Viera everyday and wakes up happy about going to school. There is a sense of disappointment when she learns that it is the weekend and will not be attending school. Since Selena has been attending Casa Vera, I have noticed and increased desire to learn and an exceptional development in her - intellectually, socially and emotionally. It is reassuring to know that our daughter is being well cared for in a warm, friendly, safe and secure environment. Casa Vera Montessori School is much than educational learning center, it is a home away from home we would like not consider sending our daughter to and other school. Wishing you and your family a Merry Christmas, Thank you for being so good teacher, Emily is learning so much and enjoys school very much. Is high quality and independent learning. Friendly and knowledgeable trained staff. Activities are geared towards exploring and experimenting, excellent curriculum and place for early learning and development.